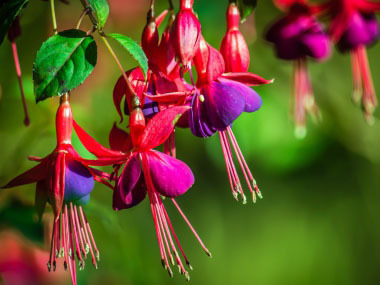 Originally, nearly 100 varieties of fuchsia were known, but they have been hybridized so much that today there are actually countless varieties on the market. Fuchsia x hybrida is a cross between Fuchsia magellaniaca x Fuchsia coccinea x Fuchsia fulgens x Fuchsia arborescens. 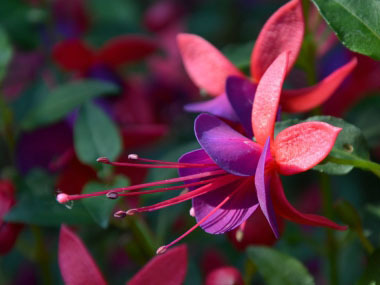 Fuchsias (in the Onagraceae family) are low growing, bush or sometimes tree-like plants. 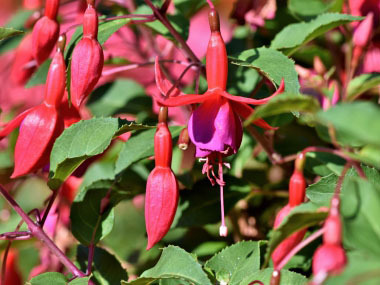 Avoid nursery-bought Fuchsia (Fuchsia x hybrida) flowers, as they may have been sprayed. According to Green Dean, the fruit and flower is edible. He says it has a subtle grape flavour with black pepper tossed in. Blossoms are edible raw. Fields of Nutrition has medicinal benefits and vitamin/mineral content of Fuchsia. Colours: Red, pink, white, violet, purple and bicolours. Medicinal qualities: There appears to be no literature on the medicinal values of this flower. Other varieties may have documented medicinal uses. Dye: Unknown. Black dye is derived from the bark of other fuchsia varieties.